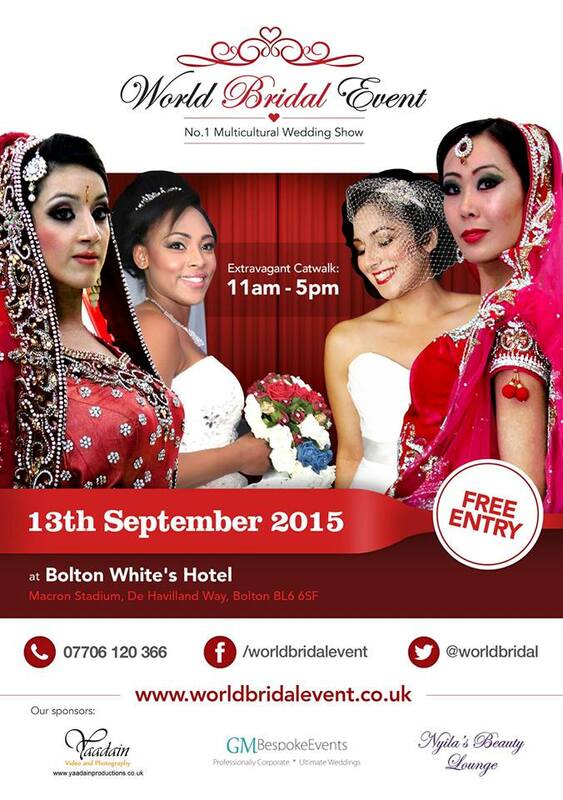 20 20 Exposure are pleased to announce that we have been invited as part of our promotions and marketing packages to attend the World Bridal Event at Bolton White’s Hotel on the 13th September 2015. We are using our marketing skills to help co-promote the event with the organisers, for this fabulous and very glamorous glitzy multicultural wedding event. It offers a great crossover of many different exhibitors to prospective brides from right across the North West of England and beyond, as it gets regular visitors from people from Yorkshire, the Midlands, North Lancashire and North Wales. The even is held on one day with entry being totally free. The sheer spectrum of services to look at and talk to is unrivaled. As 20 20 Exposure we will be bringing along to this special and unique event one of the North West’s popular DJ’s, Dave Bradley. He will be provieding the music and P.A. facilities on the day as well as acting as host / compere. For more information on exhibiting at the prestigious event please ring 07706 120 366.